On March 12, 2019, Ambassador He Xiangdong bids farewell to Hon. Ezekiel Lol Gatkuoth, Minister of Petroleum of the Republic of South Sudan. Minister Lol briefs Ambassador He the latest development of the oil production in South Sudan. Minister Lol speaks highly of the key role played by Chinese oil companies in the petroleum sector of South Sudan, and says that South Sudan would like to further strengthen cooperation with China in petroleum sector, to advance South Sudan-China bilateral friendly relations and cooperation. The minister wishes the Ambassador greater success in the future. 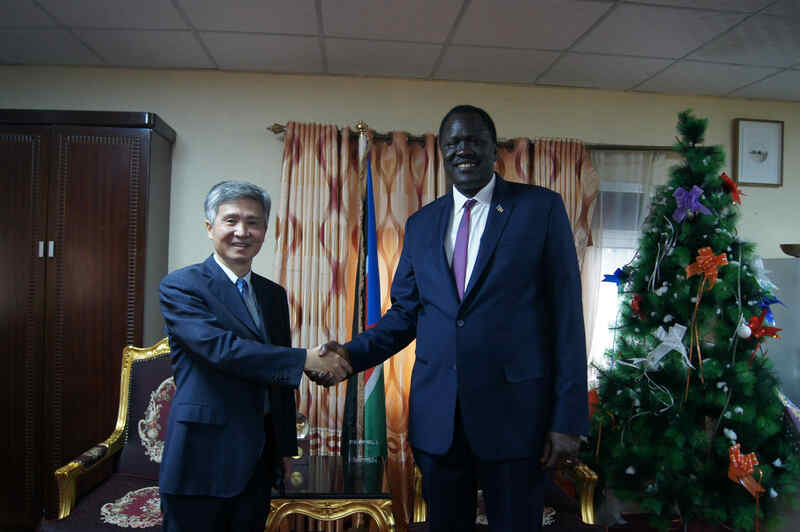 Ambassador He commends Minister Lol for his support to China-South Sudan petroleum cooperation. Ambassador He said that cooperation in petroleum sector is an important part of China-South Sudan cooperation. China is willing to work with South Sudan to strengthen cooperation in petroleum sector, so as to promote peace and stability of South Sudan, and realize economic and social development in South Sudan.